I was unsure what to expect with this book by Carrie Snyder. I chose it because in my youth I was a runner and the story premise intrigued me, unusual for a novel. It is fiction based on a real event. 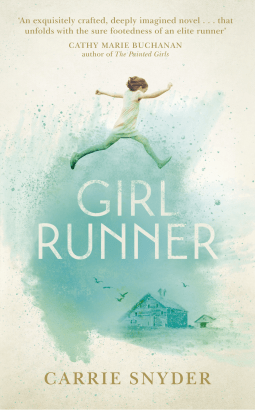 The key fictional character, the ‘girl runner’, is Aganetha Smart. She wins the gold medal at the 1928 Olympics for the ground-breaking Canadian team of female athletes. The historical setting is real and is a fascinating glimpse into the barriers which women faced in 1920s and 1930s Canada and society’s attitudes to the strength, ability and success of women. But this novel is not just about athletics, it is the story of Aganetha’s life, of the child who liked to run and how a random chance allowed her to train with a running coach. Eventually she won her gold medal at the Amsterdam games. This is a book about the growth of a girl into a young woman, and from a young woman into an old one, lugging with her the memories, guilt and secrets of her childhood. Running colours Aganetha’s life, her character, and her approach to problems. For Aganetha, running is everything. When feeling troubled as a child, she runs. When feeling trapped as an elderly woman, she pulls on her running shoes and goes out into the fresh air. Running is at the core of her character, but is she running to win, to be a champion, or to run away? When, in her forties, she is asked where she wants to be, she replies without hesitation, “running”. We cannot understand Aganetha without the story of her family, she is the child of her father’s second marriage and so the home is full of step-siblings. Perhaps the novel would have benefitted from less siblings, sometimes too many characters can clutter the narrative and at times the story jumps around a bit in time. The detail in which the rural life of this family is told – with the mother who cares for distressed girls, and the father who builds a lighthouse in the field – reminded me of Jane Smiley and Anne Tyler. At the end of the book we find the answer to a secret from Aganetha’s youth: this mystery is so subtly handled that I missed the first clues, so the solving of the mystery fell a little flat. There is also a second line of narrative involving two young people who arrived unannounced at Aganetha’s care home and take her back, in her wheelchair, to the country home where she grew up. For a long way through the book the relevance of this storyline was unclear, but it becomes clear at the end. For Carrie Snyder’s website, click here.